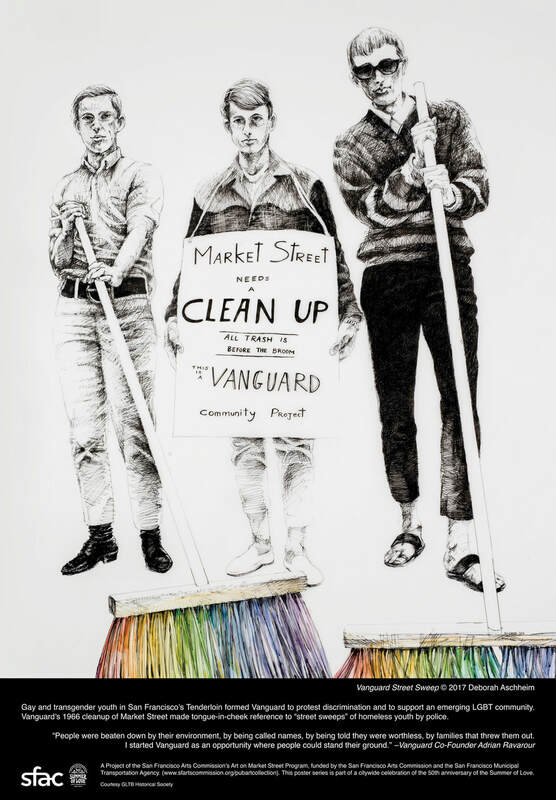 "Adrian Ravarour brought his friend Billy Garrison to ask about their using Intersection as meeting place for a proposed new organization of LGBT youth of the Tenderloin area. Adrian was a staff member of Intersection…I had been associated with Glide Methodist Church and the Glide Foundation for a number of years as the Associate Minister of Glide Church just prior to Cecil Williams…I knew that the proposal which Adrian and Billy had, while having great merit was not directly in keeping with the purpose of Intersection, but was clearly in keeping with the program of Glide. Therefore I said no to Intersection’s sponsorship, but urged them to take it to Glide." In the Reverend Dr Laird Sutton’s essay My Ministry: A Personal Quest (June 17, 2017) he summarized, "A most valuable full time staffer was Adrian Ravarour, fulfilling his calling as a Mormon priest. Adrian recognized and responded to the spiritual mission of art and has spent his life fulfilling this calling. He later was the founder of Vanguard a ministry to the youth in the Tenderloin." And his September 1, 1967 letter of reference for Ravarour noted that Adrian as "a staff member of Intersection…displayed not only artistic and creative skill but the utmost integrity and thoroughness in his work…He is highly respected by the artists and art-patrons he has come in contact…There is no hesitation in regards to commending his character which I have found to be of the highest order. He constantly displayed keen understanding, resourcefulness, patience and absolute honesty. I take pleasure in vouching for the excellent character of Mr. Ravarour." (2) In Glide’s 2013 Beyond The Possible written by Co-Directors Rev Cecil Williams and Janice Mirikitani, Ms Mirikitani identified Rev Sutton as the person that sent the unnamed youth (Ravarour) who started Vanguard at Glide, "the name of Laird Sutton, a minister who worked with Glide spin-offs, as a contact to help them get started. Soon Vanguard was meeting at Glide" (HarperOne, San Francisco, 2013) In fact, Juan Elorreaga and Ravarour regularly sat at Poet Laureate Janice Mirikitani’s desk after Vanguard meetings because Juan insisted that Ravarour share his progress using the Socratic Method in teaching the Vanguard youth civics. (3) In a letter dated January 14, 2016 from former SIR President and former Vector editor Leo Laurence, JD, Mr Laurence who was a radio reporter and a columnist at The Berkeley Barb recalled that, "The Vanguard organization founded and managed by Adrian Ravarour, Ph.D. magically provided valuable mentoring to the young street kids of San Francisco’s notorious Tenderloin district, downtown. I vividly remember walking into a Vanguard meeting at the Glide Methodist Church. "…"I think the reason why the street kids liked Ravarour’s Vanguard so much is because he showed them respect and recognized their intellectual skills." He ended his letter by, "Ravarour somehow, easily, worked with these Tenderloin street kids and showed them respect. I published a long story in the Berkeley Barb on Ravarour’s amazing Vanguard organization, helping street kids in San Francisco Tenderloin district." (4) Gloria Elber responded to a request for her memories in an email dated June 1, 2011, "You asked me what I knew about Vanguard? Mark Miller told me that when he meet you at a Vanguard dance you were known as Vanguard's founder. When I asked you about this in 1968 you acknowledged that this was true. You went on to explain that you used civil rights and French models. In the past 43 years I have seen you continue work as a degreed professional and can vouch for your honesty. I believe that all the Elber family knew your history and were very impressed with your modesty. Sarah Elber was particularly moved and compared Vanguard to her own family's involvement with unionizing in the San Francisco bay area. You said that it had to be done and you went forth and did It!" Sincerely, Gloria Elber former Executive Director Frohman Academy Carmel." (5) Reverend Hansen’s Glide ministry was not a part of Vanguard, September 1965 to May 1966. He occasionally dropped into Vanguard meetings to inform the youth he was a counselor if any of them needed to talk. Ravarour sent Vanguard members to ask Rev Hansen if Vanguard could use Glide’s basement for its 1965 holiday dinners. Reverend Hansen’s email dated March 8, 2012 recalled, "I know we did have dinners in the Glide basement/ fellowship hall area, I think on or near Thanksgiving and Christmas." (6) Reverend Hansen’s email dated September 7, 2011, confirmed, "Rather than being "assigned" to meet with Vanguard...I don't remember how many times I met with Vanguard, except that it was certainly more than once and likely only a few times before I left to return to Claremont." Reverend Hansen has forgotten after Vanguard accepted Glide’s sponsorship that began in June 1966 he served as Glide’s liaison bringing portions of the two applications for Vanguard members to approve by vote. Ravarour asked Reverend Hansen to write something for publication and he responded with the following on March 3, 2011: "EHansen To Ravarour Mar 3, 2011 Dear Adrian Ravarour, I am honored that you have kept me in the loop regarding your writing. The period you write about was a dynamic, exciting time. My internship, supported by the Glide Foundation and directed through the Urban ministry program there, provided many new experiences for my life and challenged me to grow in various ways. I was only there for about 11 months before I left and returned to Claremont to continue my studies at the Claremont School of Theology. As best as I recall I was there at Glide from about September 1, 1965, through July of 1966. Your involvement with the young people of the Tenderloin area and your key role as the founder of Vanguard has provided a legacy that must have touched many lives. I was glad to be a part of this, even in my small way. I wish you the best with your writing project and hope it goes very well. Sincerely, Ed Hansen, United Methodist clergy, retired"
(7) Before Reverend Hansen began to attend Vanguard meetings in June and July 1966, his first nine months of youth ministry to Tenderloin youth was not specifically related to Vanguard. His April 9, 2011 email recollects Joel Roberts who later contributed to Vanguard, "My memories of Joel Roberts are not related to Vanguard, but to other interactions with him…I also taped an interview with him to use as a program in local churches." And Rev Mamiya replied on January 12, 2011 in an email to Ravarour, "Adrian: Yes, I recall that you were called the founder of Vanguard by the DJ at the dances and JP and the kids. The San Franciscan Wayne Friday was the adult who graciously served as Disc Jockey for the Vanguard Dances. (10) While the Council for Religion and the Homosexual was not involved in the 1965 founding of Vanguard or Ravarour’s structuring and leading Vanguard. After Glide began to sponsor Vanguard in June 1966, EOC organizer Mark Forrester who was also a member of CRH was hired to write Vanguard’s application for the EOC War On Poverty grant. Marat and Forrester developed a friendship and both gave interviews and wrote for the first two issues of Vanguard Magazine. But CRH was not directly involved in Vanguard as its four year summary, CRH: 1964/1968 council on religion & the homosexual. CRH: 1968, details all of CRH programs, advisement, and activities that it achieved locally, nationally and internationally. Vanguard is not listed under "History p4" or "Programs p6" or "The Work of CRH p7" or "Reaching the Religious Community p7." Instead, Vanguard is listed under the heading of "Reaching the Homophile Community" and it is only mentioned after other organizations. The second paragraph finally mentioned Vanguard and the entire relationship is summarized on page 9 as, "CRH has maintained ties with Vanguard, a San Francisco organization of street youths, many of whom are homosexual or engage extensively in homosexual activity, has contributed financially to Hospitality House which seeks to provide a comfortable and friendly meeting place for these youths, and has offered counseling services for those who wish to talk about their problems." One sentence of fifty-seven words. The donation to The Hospitality House occurred in 1967 two years after Vanguard was founded; and, the specific "ties" refers to the friendship of CRH member Mark Forrester and Vanguard president JP Marat. (11) It is unclear whether the Glide assisted 1967 re-organization of Vanguard ceased functioning in February, March or in August 1967. There are Vanguard Magazines during these periods, but the Vanguard Magazine, Volume 1, Number 9, published in August 1967, reported that, "This magazine does not represent an organization. Six months ago, Vanguard: The Youth Organization, Inc., which this magazine was loosely affiliated with, ceased to exist, in the popular sense of the word. At that time, Vanguard’s hierarchy of officers and tiers of members dissolved the community…Vanguard: The Youth Organization, Inc. has now one member: a president." Heroically, Vanguard editor Keith Oliver St.Clair continued Vanguard Magazine until 1978 as a community forum that welcomed articles, "open to the gay, the straight, the hip and the black community." In November 1967 EOC funds were disbursed and Reverend Williams was instrumental in assisting the creation of The Hospitality House as Glide’s long intended service agency for the Tenderloin youth.